The Falleen Federation is a union of the various Falleen clans that governs the Doldur sector, with expansion territories in Druess, Chommel, Vilonis, Lambda, Artesia, Merren, and Sujumis sectors. It is currently one of major economic powers in the galaxy, thanks in part to its Crown Corporations: Falleen Engineering Contracts, CryoMed Laboratories, and Falleen Naval Contracts. The Federation is widely renowned for its rich culture, including religion, celebrations, and education. Its current Head of State is King Jado Dur`rik. The Falleen Federation has a proud history. Here it is, in brief, as compiled by Falleen historian Spumis Ruppee. The Falleen Federation was founded on Year 0, Day 255, after years of oppression by the Galactic Empire. The announcement of founding was made by Prince Tholin Dur'aak after a joint task force of the united clans and Rebel Alliance defeated the Imperials during the battle of Falleen. Prince Tholin became the leader of the interim government whilst an official governing body was built. By all accounts, this was a time of assassination and betrayal. The Falleen Federation was mostly without a fleet during this period. The Falleen, though, are nothing if not determined, and they thrive during adversity. Following the tenets of Kiyorath Dhin and his prophet Chir'dorna, the Federation began to strengthen and expand. A government was established, and Tholin was crowned king. It wasn't a time of peace, but it was a period of relative stability. In the fourth year of the Falleen Federation, King Tholin abdicated the throne. His successor, Eldrik Kuraine, had a special hatred of the Galactic Empire. This hatred led to the conception of Operation: Shadowstone. The Imperial Star Destroyer Shadowstone was attacked by operatives working for King Eldrik. After a protracted battle between Federation battle droids and Imperial stormtroopers, the Star Destroyer was captured. While a great victory for the Falleen Federation, it would lead to one of its darkest days. The destruction of the Libra battle station by Uebles' Empire. The day of the Battle of Beta has gone down in the annals of galactic history. King Eldrik was betrayed and murdered, and The Federation stronghold of Beta was then invaded. Federation forces were saved only by a tactical retreat planned by Lord Admiral Bisz Aldaris. Beta was lost, and entire populations were exterminated. Though the Federation lost, it was indebted to the Lord Admiral for his command of the situation. At the end of Year 4, the Lord Admiral became King. Bisz Aldaris of the Mindano Clan, perhaps in response to the tragedy at Beta, began a massive military expansion. A renewed focus on diligent service also helped propel the Falleen Federation to become one of the premier galactic powers. In Year 5, King Bisz and his advisors signed the Falleen Federation Charter. In Year 7, the Falleen Federation was instrumental in forming the Galactic Alliance to restore the Republic. The FF was growing and expanding in both territory and influence. Governments ebb and flow, however, and power can only increase for so long. At the end of Year 9, the Tresario Star Kingdom was floundering and on the brink of dissolution. A solution was reached by bringing the TSK into the Falleen Federation as a protected domain. While this treaty worked in the short term, it eventually served to hurt both governments, and the Galactic Alliance as a whole. The Tresario Star Kingdom seceded from the Falleen Federation in year 12, citing problems with King Bisz's policies and rampant Galactic Alliance corruption. This diplomatic conflict ended with the desertion of some key Falleen personnel and Regent Rick Farlander rising to the throne. King Rick Farlander's reign was a brief one - just over a year – but his stint as the head of the Falleen Federation is recognized as a time of revitalization for the Falleen clans. He burned bright as the king of the Falleen, but he burned out fairly quickly. Jado Dur'rik's ascension to the throne marked the return of power to the Huruk-Rah clan. Jado returned the Falleen Federation to its roots of being a more compact and elite government. 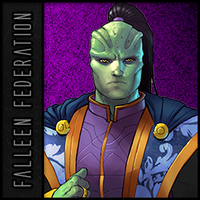 The Falleen Federation left the Galactic Alliance near the end of Year 14, effectively taking control over its own destiny, and returning control of the Falleen Federation to the federated clans. The Falleen Federation has done well under the control of King Jado Dur'rik, his Regent Mephiston Leonatos, and Chancellor Ixzis Xojur. The Federation continues to build its military, set up protectorates, and continue to be an economic power. Kiyorath Dhin continues to bless as the Falleen Federation follows the principles of survival, excellence, and integrity. The Falleen Federation follows the principles of "Liberty, Equality and Justice." As such, the Federation is accepting of other species and has members of many races other than Falleen. The Federation has a standard pay scale based on rank; however, only active members who post for payment will get their credits for the month. Every new recruit is given the rank of cadet and will be given an instructor from the Ichigo Academy to lead them through lessons including primers on Hyper Travel to subordinate management. Each cadet will take tests on their lessons, and after passing the lessons, they will move on to practicals. A practical is the name given to a hands-on lesson that the cadets will master. After completion of all lessons, the cadet will choose one of the branches to enlist in. At this time, the cadet will be awarded the next rank up in their chosen branch. The Federation is led by the King of Falleen (Jado Dur`rik) and made up of three ministries: Ministry of Defense, Ministry of State and Ministry of Engineering. Each led by a Minister who answers to the King. These Ministers are guided by Regent Mephiston Leonatos and Chancellor Ixzis Xojur. The ministries are further divided into departments, led by secretaries who answer to their respective Minister and Deputy Ministers. The regular Falleen Federation Military consists of the Falleen Protection Force, which is divided into various task forces, while all other members of the Federation act as reservists. To ensure a high quality officer staff, only once an Acting Lieutenant (enlisted) has proven capable and reliable are they commissioned a Lieutenant by the King himself and allowed to progress through the officer ranks and higher. Crown Corporations are companies that are owned by the Falleen Federation. Year 0 Day 255: The Falleen Federation is formed. Year 2 Day 69: The Falleen Federation signs the Constitution of the Republic. Year 3 Day 72: Eldrik Kuraine‎ is formally crowned as monarch of the Falleen Federation. Year 4 Day 362: King Eldrik Kuraine is murdered at Beta by Sith assassins. Year 5 Day 350: King Bisz Aldaris signs the Falleen Federation Charter. Year 13 Day 151: Rick Farlander replaces Bisz Aldaris as monarch of the Falleen Federation. Year 14 Day 123: Jado Dur`rik replaces Rick Farlander as monarch of the Falleen Federation. Year 14 Day 308: The Falleen Federation withdraws from the Galactic Alliance. This page was last edited on 30 December 2018, at 16:28.